Scientists have identified an unexpected metabolic ability in a symbiotic community of deep-sea microorganisms. It may help solve a lingering mystery about the world's nitrogen cycle. The element nitrogen is a critical part of amino acids, the building blocks of proteins, and therefore essential to all life. Although nitrogen is plentiful on Earth--it represents 78 percent of the atmosphere, by volume--the element is usually found strongly bonded to itself. To be biologically useful, a nitrogen atom must be released from this coupling and converted to a reduced, or "fixed," state; reduced nitrogen atoms gain an electron, which makes them chemically reactive. Although lightning, combustion, and other non-biological processes can create reduced nitrogen, far more is generated by nitrogen-fixing microorganisms such as bacteria, in particular, photosynthetic aquatic cyanobacteria. These organisms produce the bulk of the nitrogen available to living things in the ocean. When researchers add up all known sources of fixed nitrogen--biological and otherwise--in the global nitrogen cycle, and compare it to the sinks (biological uptake for growth and energy), they come up short. More nitrogen appears to be used than is being made. The "nitrogen budget," in effect, does not balance. The question has been whether the nitrogen cycle is out of balance, or whether the known inventories of sources and sinks are incomplete, says Victoria Orphan, a geobiologist at Caltech. Orphan, along with Caltech graduate student Anne Dekas and Caltech postdoctoral researcher Rachel Poretsky, suggest the answer is, at least in part, an incomplete catalogue of the sources of fixed nitrogen. A paper about their discovery appears in the journal Science. 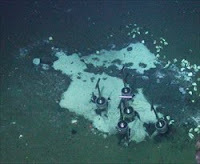 The team studied ocean sediment samples in methane cold seeps 20 miles off northern California at a depth of 1,800 feet. The area, known as the Eel River Basin, is in a region that supports high levels of natural methane seepage at the sea-floor. In the laboratory, the researchers examined the methane-rich sediment and the tiny microbial conglomerations that live within. These spherical cell conglomerates, averaging 500 cells each, consist of two types of anaerobic microorganisms living in a unique symbiotic relationship fueled by methane. The first is a bacterium that reduces the chemical sulfate into sulfide (the process that produces the rotten-egg odor of salt marshes and mud flats) to generate energy. The second is a methane-oxidizing archaeon; the archaea are a group of non-bacterial single-celled microorganisms. Working together, these two symbionts are responsible for consuming the majority of the naturally-released methane in the deep sea. Although these symbiotic associations themselves are not new--the conglomerations were found about a decade ago--the scientists discovered something unexpected: the methane-consuming archaea were actively fixing nitrogen, and sharing it with their bacterial neighbors. This is the first time nitrogen fixation has been documented in methane-oxidizing archaea, say the scientists. "The past discovery that archaeal/bacterial consortia were the agents of methane oxidation led to a paradigm shift in our view of carbon cycling at the bottom of the ocean," says Matt Kane, program director in the National Science Foundation (NSF)'s division of environmental biology, which funded the research, along with NSF's division of ocean sciences. "This new finding extends that paradigm shift to the nitrogen cycle. "Such discoveries are revolutionizing how we think about microbial physiological ecology and its impact on Earth's biogeochemical cycles." Although the organisms have a nitrogen-poor diet of methane gas, they live in an environment that has reduced nitrogen in the form of ammonium and other chemicals, which means they shouldn't need to create their own. It's possible that they do need to because they are living in a crowded community, say Orphan and colleagues, a tightly packed ball that prevents some organisms from having access to nitrogen. The organisms have ultra-slow growth rates, doubling once every three to six months. "But they are passing on some nitrogen to their neighbors, which means they are producing more than they need, despite the energy cost of doing so," Dekas says. "We don't know what benefit the archaeal organisms get from sharing it, but we know they need the bacterial symbiont to stay alive."